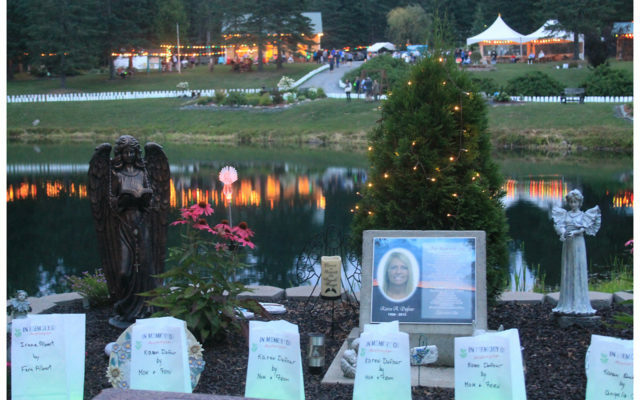 More than 1,400 luminarias illuminated the walkway around the Mizpah pond Sunday night to celebrate and honor those who are fighting cancer and those who have lost their lives to cancer and other life-ending ailments. 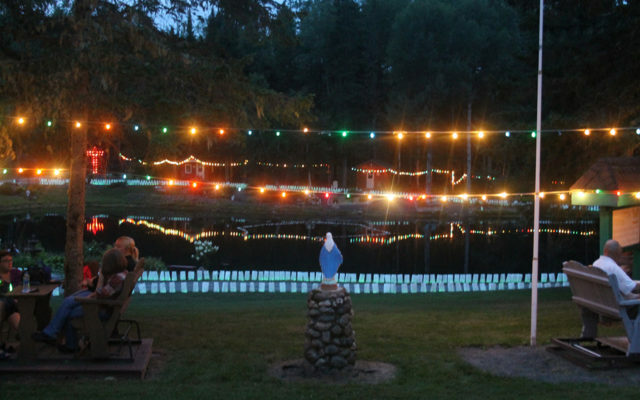 GRAND ISLE, Maine — More than 1,400 luminarias illuminated the walkway around the Mizpah pond Sunday night to celebrate and honor those who are fighting cancer and those who have lost their lives to cancer and other life-ending ailments. The illuminated bags, filled with glow sticks, lined the path that visitors walked to enjoy the evening with family and friends. Each bag was sold for $5 with the proceeds used to put on the event or set aside for operational expenses for the Mizpah property. Every bag contained the names of the person being honored and the ones who purchased the luminaria. The late Richard Corbin founded Mizpah — which means “helping one another” in Hebrew — in 1991, dedicating the then 15-acre site to instilling the feeling of spiritual healing in visitors. Doctors diagnosed him with Hodgkin’s disease when he was 22 and gave him less than one year to live. But he survived through many treatments and surgeries to age 71. Today, more than 4,000 people visit the expanded 109-acre site from May to October. The property has grown to include a cancer survival wall, a fish pond, gardens, cabins, a chapel, welcome center, and several trails that visitors are encouraged to walk as they meditate and reflect. During the annual candlelight walk to honor survivors and the deceased, at least 200 people attended. Brenda Theriault, a member of the Madawaska Select Board, attended the walk in memory of her late sister, Karen Dufour. “For the people who have been lost, this is a spot dedicated to them,” Theriault said. She said she tends to her sister’s memorial garden during the week. The only stipulation that Mizpah has for people wanting to make a special space for a loved one on the property is that they care for the spot themselves. “It’s a place where we can come be alone with our thoughts,” Theriault said. People from all over the state and as far as Florida attended the walk Sunday night, according to Roger Corbin, vice president of the board for Mizpah and brother of founder, Richard Corbin. Some of the funds from Sunday’s gathering also will go toward completing construction of a cancer house on the property that will be opened next year. The structure will be available for cancer patients and their families to enjoy a two night stay on the property, which Corbin said will give them spiritual peace and a time to reflect. John Pelkey, son-in-law to Roger Corbin, was in attendance with his family, including his two boys who are active volunteers at Mizpah. Oliver, 9, and Nolan, 7, Pelkey help with the garden and both said they do it because they have a lot of fun working on the property. Corbin said volunteers are the ones who make Mizpah exist.